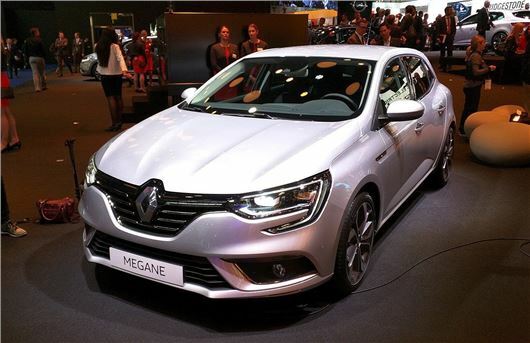 Renault has unveiled the all-new Megane at the 2015 Frankfurt Motor Show. The new model benefits from improved interior quality, better economy and up-to-date technology. It is expected to cost from around £16,750 when it goes on sale later this year. The new model is lower and wider than the outgoing Megane. It adopts Renault’s latest styling details including a large diamond badge on the nose, C-shaped lights and broad tail lights to emphasize width. Six efficient engines will be available at launch with power outputs ranging from 90PS to 205PS, with fuel consumption and CO2 emissions as low as 85.6mpg and 86g/km for the Energy dCi 110 (this diesel is also available with 90PS and 130PS). Three TCe petrol units will be available with outputs of 100, 130 and 205PS. The EDC dual-clutch automatic transmission will be offered with the dCi 110 (six-speed) and the TCe 130 (seven-speed) engines. The seven-speed EDC is standard with the TCe 205 unit in the GT...more of which later. In 2016, the diesel Energy dCi 165 engine, linked to six-speed EDC dual clutch automatic transmission, will also become available in the GT. A ‘Hybrid Assist’ diesel will be added early in 2017 with a fuel economy figure of 94.1mpg and CO2 emissions of 76g/km. Inside the car, Renault is giving drivers “technologies from the class above” - a head-up display, TFT instrument display, and portrait-style 8.7-inch screen. Multi-Sense technology will also be available, which allows drivers to personalise their driving experience by modifying accelerator and engine response. Top of the range when the car is launch will be the Renaultsport-inspired GT, with a 205PS petrol engine mated to a seven-speed EDC dual-clutch transmission. This hot hatch will get 4Control four-wheel steering and bespoke chassis settings.